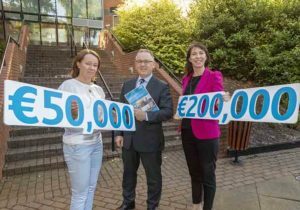 Fáilte Ireland is canvassing for attractions in the Dublin region which are interested in funding through its €1m grant scheme. It said the Dublin’s Surprising Stories 2018 scheme will support “the development of world-class visitor attractions”. Paul Keeley, Commercial Development Director, Fáilte Ireland, with Corrine Lincoln and Mary Stack, Head of Attractions, Fáilte Ireland. Heritage and visitor attractions are being invited to submit their ideas to improve the quality of physical interpretation – audio guides, video, interpretive panels and interactive technology – at their sites. The scheme will provide funding of between €50,000 and €200,000 to operating visitor attractions. Paul Keeley, Fáilte Ireland’s Director of Commercial Development. “If we are to develop brilliant visitor experiences, we need to enhance our existing attractions and bring their stories to life. Emerging technology is creating new ways for visitors to enjoy history and heritage and – combined with rising visitor expectations and international standards for immersive, engaging and interactive experiences – this creates both an opportunity and a need for this kind of development to keep our tourism offering strong. For further information on the Dublin’s Surprising Stories 2018 initiative, email: dublinssurprisingstories@failteireland.ie or click HERE for the expression of interest form.